I apologize for the lateness of the blog today. The comic, however, was up on time, so that’s what is really important. If we’re going to talk about lateness travesties, it’s that The Uncanny X-Cast, my favorite podcast, didn’t post their new weekly episode on Friday. What am I supposed to listen to now? 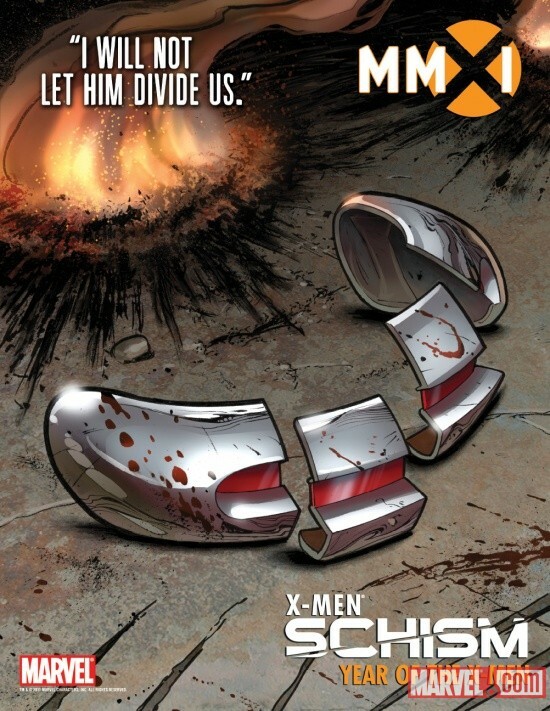 Now that I’ve brought up The X-Cast, I should probably mention that as soon as I stopped reading The Uncanny X-Men, Marvel announced X-Men: Schism, which is supposed to be kind of like Civil War, but with the X-Men. Supposedly the separate factions are led by Wolverine and Cyclops. I always enjoyed the tension between those two characters, and I’m excited to see what will come of them actually being on opposing teams. There was a poster for the event that I saw on Free Comic Book Day that really increased my excitement for the event, which I guess is what posters are supposed to do. Ultimately, I’m sure nothing will really change, but congratulations Marvel, you have my $2.99 monthly again. Actually, I’m a trade-waiter for X-Men comics, so you’ll get my $20 once it’s all over. Except I use DCBS, so it won’t actually be $20. You get the point.